Margie Boule is a general interest columnist for The Oregonian, in Portland, Oregon. She is a graduate of Whitman College in Walla Walla, WA. Margie began her career in Seattle, working at KING-AM and KING-TV in various capacities on and off the air. In 1977 she was by KATU-TV in Portland, Oregon, where she hosted and produced the number-one rated “AM Northwest” program for 10 years, and the “Two at Four” program for three years. 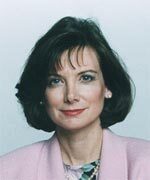 In 1987 she joined The Oregonian as a general interest columnist. She has won numerous regional and national journalism competitions in her 16 years as a print journalist. Ms. Boule has continued her singing as a sidelight, performing hundreds of commercial jingles (in her favorite, she was the voice of a singing roll of toilet paper), acting and singing in musical theater (including five years as Audrey, the cheap, trashy blonde in Little Shop of Horrors) and occasionally singing with the band Pink Martini. For three years she has performed with the Portland improv troupe, ComedySportz. She continues to sing with orchestras throughout the west; in the last year she has soloed with the Oregon Symphony, The Vancouver Symphony, and the Mid-Columbia Symphony. She is the proud mother of one daughter, Alexandra, who is in graduate school at Rice University in Texas.